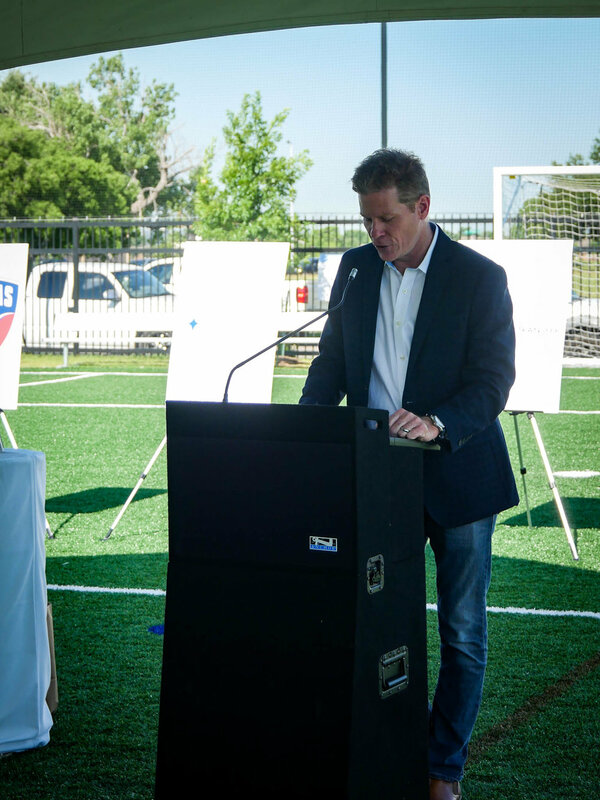 On the morning of May 17th, West Dallas community members and partners gathered to celebrate the Ribbon Cutting Ceremony of the new soccer field at the Mercy Street Sports Complex. Texas State Senator Royce West, Mercy Street Founder Trey Hill, Texas Capital Bank CEO Keith Cargill, FC Dallas Chairman and CEO Clark Hunt, and Energy Transfer Partners Executive Vice President Chris Curia spoke vehemently about the current and future impact of the field on young athletes and the families of West Dallas. The Sports Complex fields will be essential in allowing Mercy Street to better serve West Dallas youth athletes by offering a space to learn the basic fundamentals of sports while promoting a fun, safe and competitive environment for kids of every level of ability. Currently, 480 West Dallas youth and 81 volunteer coaches are participating in the spring 2018 Mercy Street Sports season.